Monday night a large party of the friends of Mr. and Mrs. Geo. Dryden, living three miles south, quietly gathered at their pleasant home to make them happy on the tenth anniversary of their wedded life. It was a complete surprise. Mr. D. was baking himself by the stove and Mrs. D. was attending to the evening household duties. The ladies slipped into the room where the family was and held their attention while the gentlemen, who had stolen into another apartment were there opening up a box of presents, which they carried into [sic] the astonished couple. Mr. Frank Alden made the presentation speech, which was feelingly responded to by Mr. Dryden. The ladies then spread a delicious supper, from the well filled baskets they had brought. Fun and frolic ruled the rest of the evening. The presents were: Cake Basket, Bread Box, Toilet Set, gent's Scarf Pin. 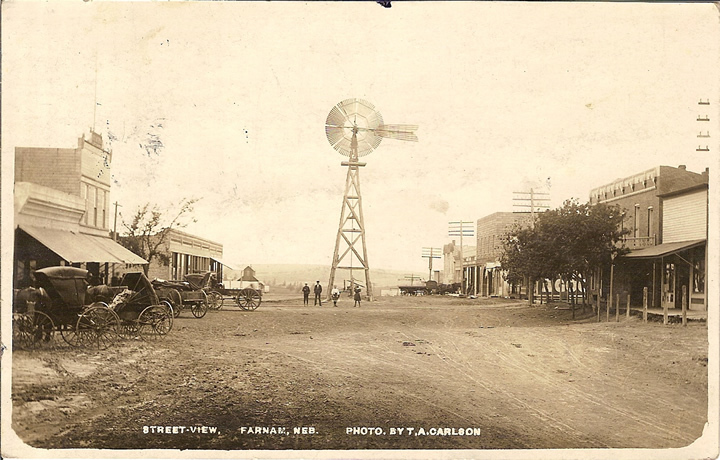 The train men like to reach Farnam, where they can pull up to such a fine deopt, so convenient to do business. H. Phillips was busily engaged last week repairing C. Brown’s house a few miles south. Mr. W. L. Declow has been putting up a Perkins wind.mill on the large farm of A. L. Merriman. Location and land-seekers are constantly arriving here to look for business sites and farms. Mr. P. P. Lawrence, of Fairfield, was here last week, on the way to Curtis to visit his son and daughter.in.law. He was traveling by wagon and viewing the country. Messers A. L. Anderson and C. A. Smith went to Moorefield last Wednesday night to a dance. It is reported that a newspaper will begin publication in Moorefield Friday.